Definition at line 70 of file PSound.h. Definition at line 59 of file PSound.cpp. Definition at line 69 of file PSound.cpp. 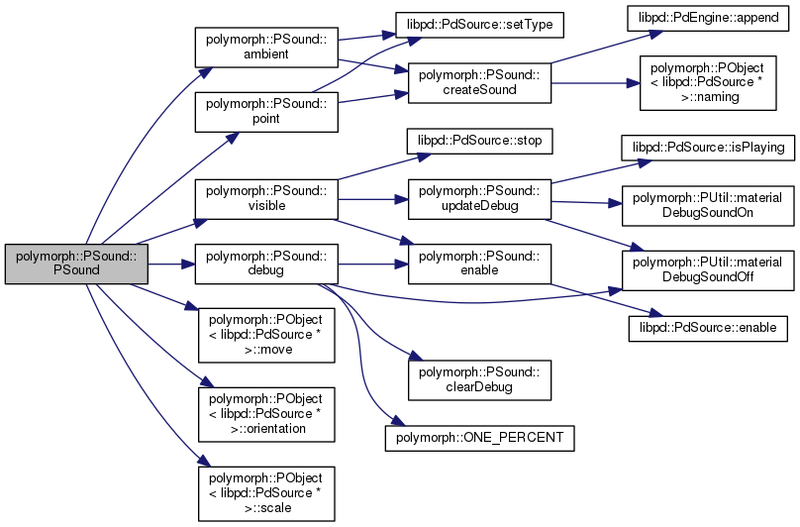 References polymorph::PObject< libpd::PdSource * >::_name, polymorph::PObject< libpd::PdSource * >::_world_mat, polymorph::PObject< libpd::PdSource * >::_world_scale, ambient(), polymorph::PObjectData::debug, debug(), polymorph::PObject< libpd::PdSource * >::move(), polymorph::PObjectData::name, polymorph::PObject< libpd::PdSource * >::orientation(), polymorph::PObjectData::origin_orientation, polymorph::PObjectData::origin_pos, polymorph::PObjectData::origin_scale, point(), libpd::PST_AMBIENT, libpd::PST_POINT, polymorph::PSoundData::sample, polymorph::PObject< libpd::PdSource * >::scale(), polymorph::PSoundData::type, polymorph::PObject< libpd::PdSource * >::UID, polymorph::PObjectData::visible, and visible(). Definition at line 114 of file PSound.cpp. Definition at line 166 of file PSound.cpp. References polymorph::PObject< libpd::PdSource * >::_object, polymorph::PObject< libpd::PdSource * >::_origin, _pde, polymorph::PObject< libpd::PdSource * >::_sceneMgr, createSound(), libpd::PST_AMBIENT, and libpd::PdSource::setType(). Reimplemented from polymorph::PObject< libpd::PdSource * >. Definition at line 247 of file PSound.cpp. References polymorph::PObject< libpd::PdSource * >::_object, polymorph::PObject< libpd::PdSource * >::_origin, _pde, _pivot, polymorph::PObject< libpd::PdSource * >::_sceneMgr, polymorph::PObject< OType >::clear(), polymorph::PObject< libpd::PdSource * >::clearChildren(), clearDebug(), and libpd::PdEngine::erase(). Referenced by isPlaying(), and ~PSound(). Definition at line 229 of file PSound.cpp. References _debug_entity, _debug_entity_dir, _debug_node, _debug_node_dir, and polymorph::PObject< libpd::PdSource * >::_sceneMgr. Referenced by clear(), debug(), and getLocalDerivedPositionUpdated(). Definition at line 120 of file PSound.cpp. 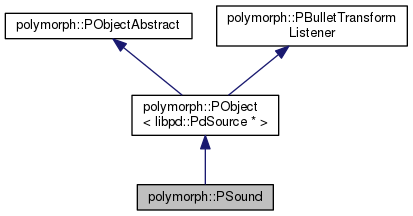 References polymorph::PObject< libpd::PdSource * >::_idobject, polymorph::PObject< libpd::PdSource * >::_name, polymorph::PObject< libpd::PdSource * >::_object, polymorph::PObject< libpd::PdSource * >::_origin, _pde, _pivot, polymorph::PObject< libpd::PdSource * >::_sceneMgr, polymorph::PObject< libpd::PdSource * >::_visible, libpd::PdEngine::append(), and polymorph::PObject< libpd::PdSource * >::naming(). Referenced by ambient(), getLocalDerivedPositionUpdated(), and point(). Definition at line 202 of file PSound.cpp. References _debug_entity, _debug_node, polymorph::PObject< libpd::PdSource * >::_debugging, polymorph::PObject< libpd::PdSource * >::_name, polymorph::PObject< libpd::PdSource * >::_origin, polymorph::PObject< libpd::PdSource * >::_sceneMgr, clearDebug(), enable(), polymorph::PUtil::materialDebugSoundOff(), and polymorph::ONE_PERCENT(). Definition at line 112 of file PSound.h. References polymorph::PObject< libpd::PdSource * >::_object, and libpd::PdSource::disable(). Definition at line 117 of file PSound.h. References polymorph::PObject< libpd::PdSource * >::_object, and libpd::PdSource::enable(). Referenced by debug(), and visible(). Definition at line 148 of file PSound.h. References _pivot, clearDebug(), createSound(), and updateDebug(). Definition at line 103 of file PSound.h. References polymorph::PObject< libpd::PdSource * >::_object, clear(), and libpd::PdSource::isPlaying(). Definition at line 132 of file PSound.h. Definition at line 136 of file PSound.h. Definition at line 124 of file PSound.h. Definition at line 144 of file PSound.h. Definition at line 128 of file PSound.h. Definition at line 140 of file PSound.h. Definition at line 269 of file PSound.cpp. 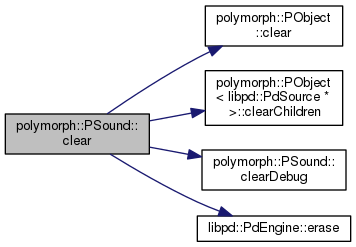 References polymorph::PObject< libpd::PdSource * >::_debugging, polymorph::PObject< libpd::PdSource * >::_object, polymorph::PObject< libpd::PdSource * >::_visible, libpd::PdSource::play(), and updateDebug(). Definition at line 142 of file PSound.cpp. 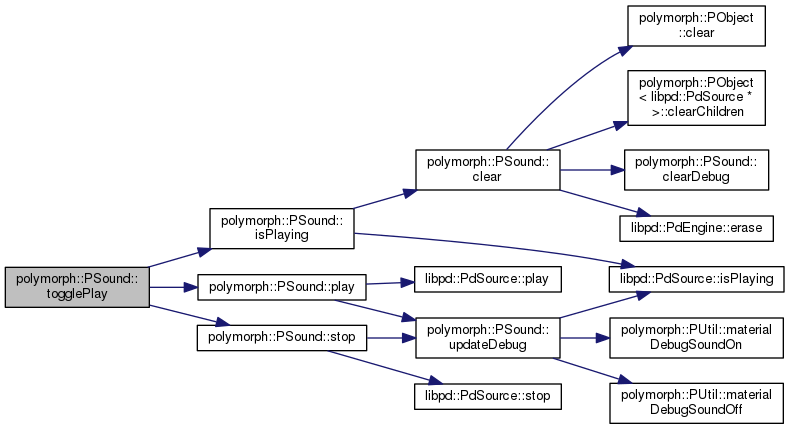 References polymorph::PObject< libpd::PdSource * >::_object, polymorph::PObject< libpd::PdSource * >::_origin, _pde, polymorph::PObject< libpd::PdSource * >::_sceneMgr, createSound(), libpd::PST_POINT, and libpd::PdSource::setType(). Definition at line 277 of file PSound.cpp. References polymorph::PObject< libpd::PdSource * >::_debugging, polymorph::PObject< libpd::PdSource * >::_object, libpd::PdSource::stop(), and updateDebug(). Definition at line 97 of file PSound.h. References polymorph::PObject< libpd::PdSource * >::_object, isPlaying(), play(), and stop(). Definition at line 285 of file PSound.cpp. References _debug_entity, polymorph::PObject< libpd::PdSource * >::_debugging, polymorph::PObject< libpd::PdSource * >::_object, polymorph::PObject< libpd::PdSource * >::_visible, libpd::PdSource::isPlaying(), polymorph::PUtil::materialDebugSoundOff(), and polymorph::PUtil::materialDebugSoundOn(). Referenced by getLocalDerivedPositionUpdated(), play(), stop(), and visible(). Definition at line 190 of file PSound.cpp. References polymorph::PObject< libpd::PdSource * >::_debugging, polymorph::PObject< libpd::PdSource * >::_object, polymorph::PObject< libpd::PdSource * >::_origin, polymorph::PObject< libpd::PdSource * >::_visible, enable(), libpd::PdSource::stop(), and updateDebug(). Definition at line 161 of file PSound.h. Referenced by clearDebug(), debug(), and updateDebug(). Definition at line 163 of file PSound.h. Definition at line 160 of file PSound.h. Referenced by clearDebug(), and debug(). Definition at line 162 of file PSound.h. Definition at line 158 of file PSound.h. Referenced by ambient(), clear(), createSound(), and point(). Definition at line 159 of file PSound.h. Referenced by clear(), createSound(), getLocalDerivedPositionUpdated(), local_orientation(), local_pitch(), local_position(), local_roll(), local_scale(), and local_yaw().